In a sharp critique of the Government of India thinking, continuing since the UPA days, that rural women are “vulnerable to sexual assault” when they defecate in the open, a recent study carried has said that such a view only distracts policy makers “from the real social divisions, based on caste, that prevent the adoption of affordable latrines”. However, ironically, the study says, “Of the same group, 7.6% reported that this had happened to them while going to the market”, underlining, “The point is not that these events are necessarily comparable. The point is that it is not a serious policy response”. The study is based on a survey on sanitation beliefs and behavior for approximately 23,000 individuals in 3,200 households in Haryana, Uttar Pradesh, Bihar, Rajasthan and Madhya Pradesh. 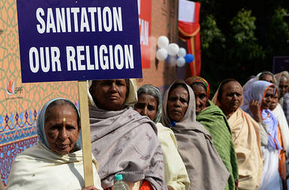 During the field work, the scholars say, they found government slogans, painted on walls or displayed on posters in government offices, which pointed to the apparent contradiction between practices that enforce women’s modesty and open defecation. “For instance, a common slogan in Uttar Pradesh is 'Daughters-in-law and daughters should not go outside, make a toilet in your house'."